With clapping and excitement and much honor, I made the Design Team on both of these new challenge blogs. The first blog is ATCs With Attitude. Meljen's is our first sponsor and she has some very cute digi stamps of all kinds. As you see above our first challenge is Flowers. So, please click on the link above and come over and play along to get in on the prize of some digis from Meljen's Designs. If you haven't been making ATC's they are fun little 2 1/2" X 3 1/2" pieces of art. Just like baseball cards and so much fun to trade around. 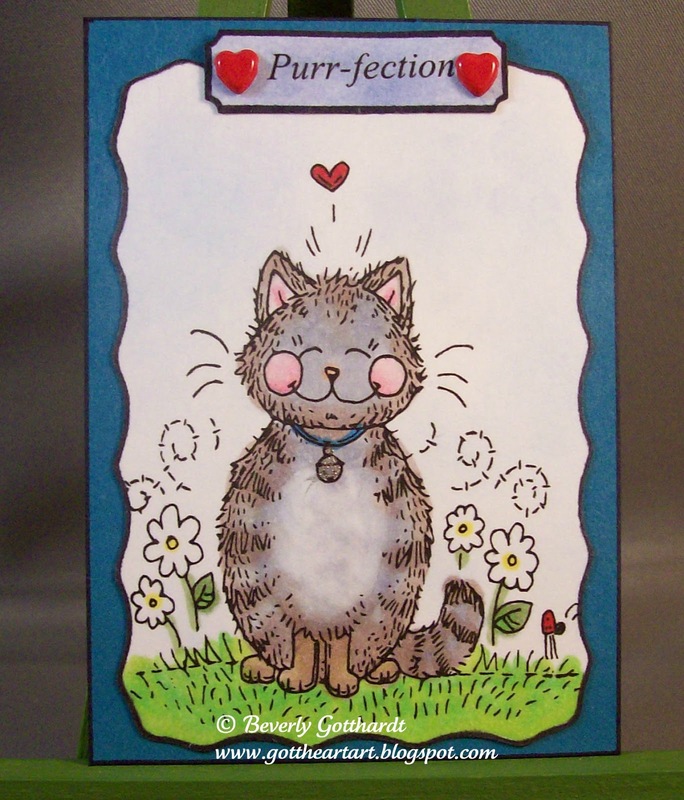 Don't be shy now, come on over and play at our new ATCs With Attitude challenge blog, the blog runs for a fortnight in American that's 2 weeks, so you've got plenty of time to mull over your design and enter for a great prize. 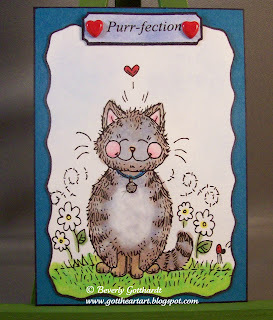 Supplies: 2 1/2" X 3 1/2" Island Indigo ATC blank, Papers: Stampin Up-Island Indigo, Whisper White, Stamp: Meljen's Designs-Too Sweet Kitty, Copic Markers, Sakura Gelly Roll Pen-silver, chalks, Black Sharpie Marker, EK Success-tag punch, Creative Impressions-tiny heart brads. Fat Pages are something new for me and they may be new for you also, so a little explanation. 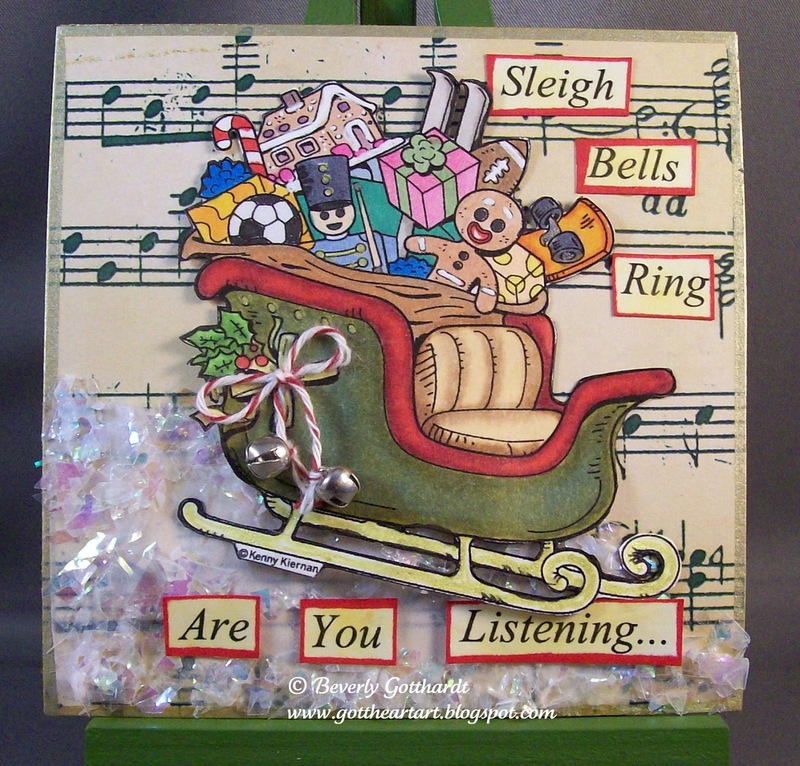 A Fat Page is a 4 X4 creation with lots of embellishment on the front of the page and a little bit on the back of the page with you detail information like on the back of an ATC. Generally, you leave about a 1/2" area on the left of the front so that some kind of holes can be punched and after you've created and swapped a Chunky Fat Book can be created. Or, you are free to turn them into hangings, or cards, the main stipulation is that they are 4 X 4 and sturdily created because when you are finished they are very tactile and people will love to handle them for their viewing pleasure. Now, that all that has been said, on to our first challenge here at Fat Pages With Attitude. As you can see above our first challenge is Christmas. Kenny K Designs and Dezinaworld are our two sponsors and Kenny K will be giving away some digis for our randomly drawn winner. I used Kenny K's Sleigh digi for this Fat Page. As soon as I saw this stamp this song came into my head. I had this great paper from The Paper Studio and I immediately knew I wanted to use the new Mica Flakes I had ordered not to long ago. Sometimes here in N. Texas we have to create our own snow. We get lots of ice, but not much snow. This challenge will run for a fortnight or as I said before in American, 2 weeks, so even with all the holiday preparations going on you've got plenty of time to fit in these 2 new challenges on you challenge lists. We'd love to have you come over and play, hope to see you soon. 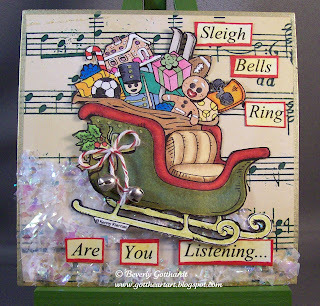 Supplies: 4 x 4 piece of Kraft card stock, Papers: The Paper Studio, Stampin Up-Whisper White, Vellum , Stamps: Kenny K-Sleigh digi, Copic Markers, chalks, Sakura Gelly Roll Pens-silver, gold, white, Sharpie Paint Pen-gold, Stampin Up-Cherry Cobbler Bakers Twine, Stampin Up-tiny silver jingle belles, Stampin Up-Mica Flakes, Art Quest-Perfect Paper Adhesive Matte. You are a great choice and big congratulations! Both are just wonderful as always! Have a great evening!